Merchandise is one of those products which are sold on retail outlets, produced by a plethora of producing companies. Selling these products thus becomes the sole responsibility of the retailers. While, the sale of merchandise depend on factors like the locality, the purchasing power of consumers and the rate of demand and supply, the sales on depend on how the retailer employees work. 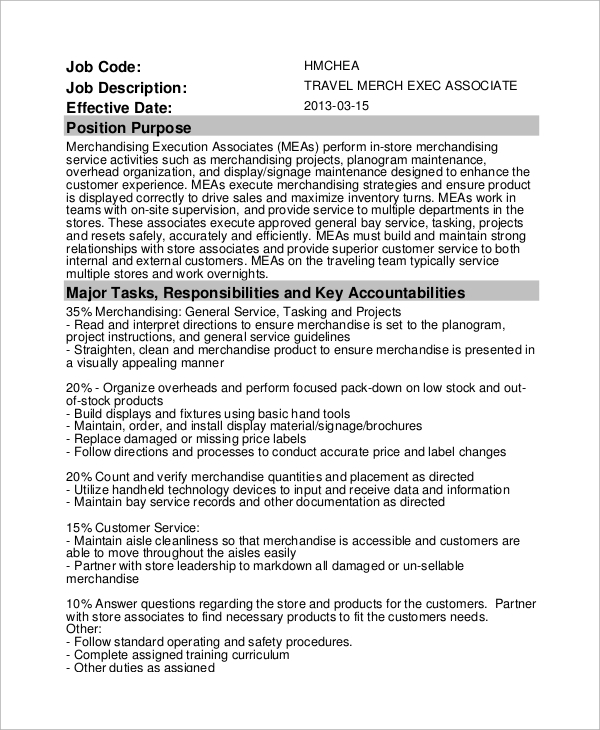 Here is a list of Job Description Samples for retailers selling merchandise. 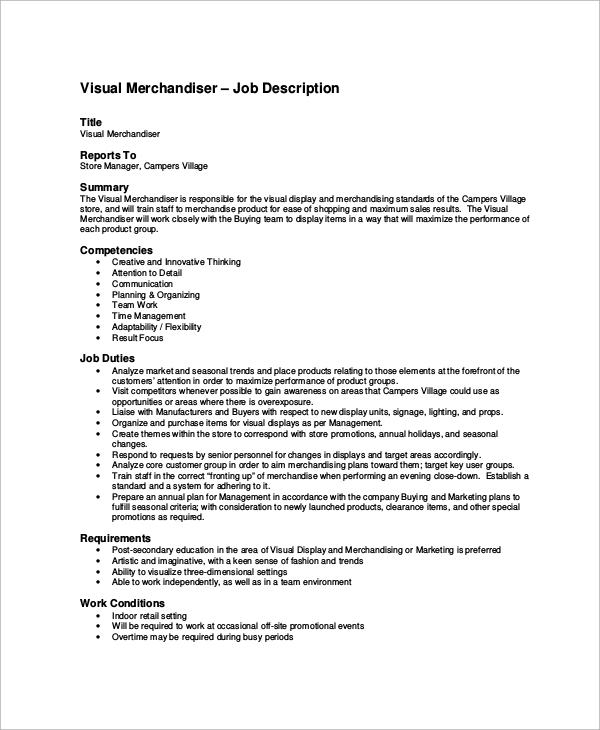 A visual merchandising manager is responsible for arranging the series of merchandise available in the retail outlet in a manner which visually appeals to consumers. They are responsible for directing the placement of products. Perhaps the most important job in a retail store, a person adept in selling products and merchandise is an asset to retailers selling products. They accommodate a number of selling strategies. 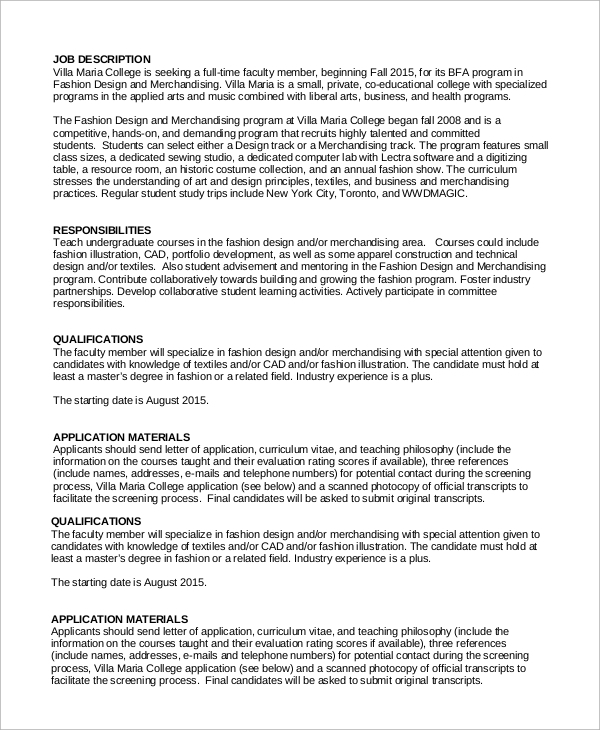 When a retail outlet deals with clothing and fashion, it becomes the responsibility of a merchandiser aware of fashion designing to understand the dynamics of the current fashion and arrange fashion products to optimize sales.You can also see Loan Officer Job Description Samples. Merchandising is an important component of selling products on the part of retailers, and experienced merchandisers are what is needed to complete sale targets. 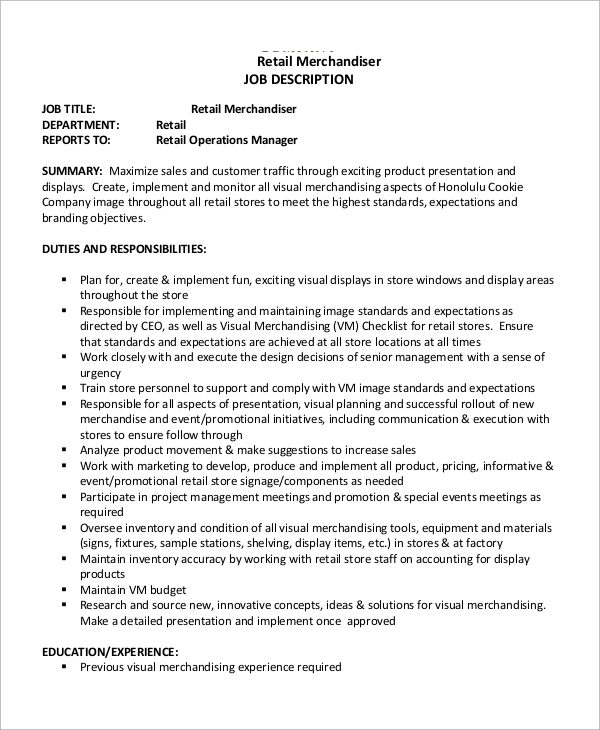 The Job Descriptions are useful for precisely getting hold of talented, innovative and qualified merchandiser who can accomplish sale objectives by utilizing their skills and expertise at marketing, selling and the ability to engage with consumers in a manner to convince them to buy the product that is being sold at the retail outlet. Thus, job descriptions would enable the retailers to search for qualified and experienced employees with relative ease, allowing them to utilize their services. 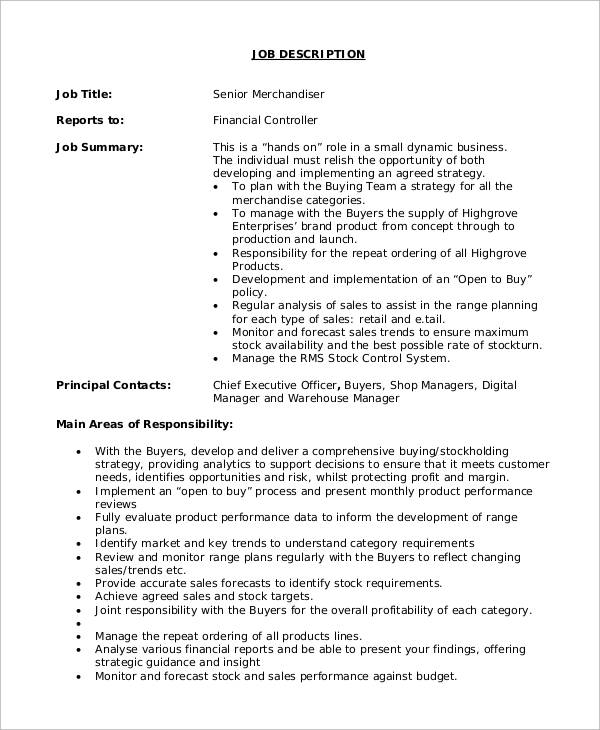 An assistant merchandiser is an individual who assists in conceptualizing, planning and executing merchandising schemes with the merchandiser to whom they have been assigned to in the retail outlet. 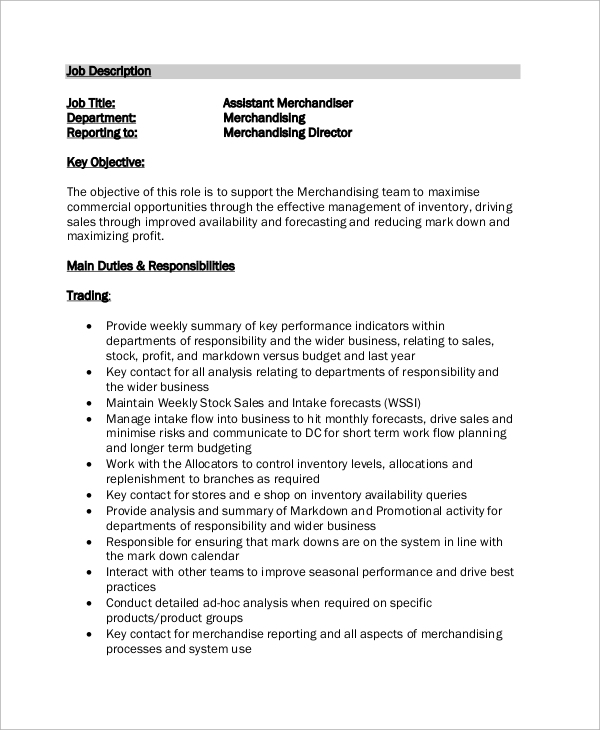 An assistant to a merchandising manager assists them in managing merchandising operations in a retail outlet so as to optimize the amount of sales of products and merchandise a retailer hosts. 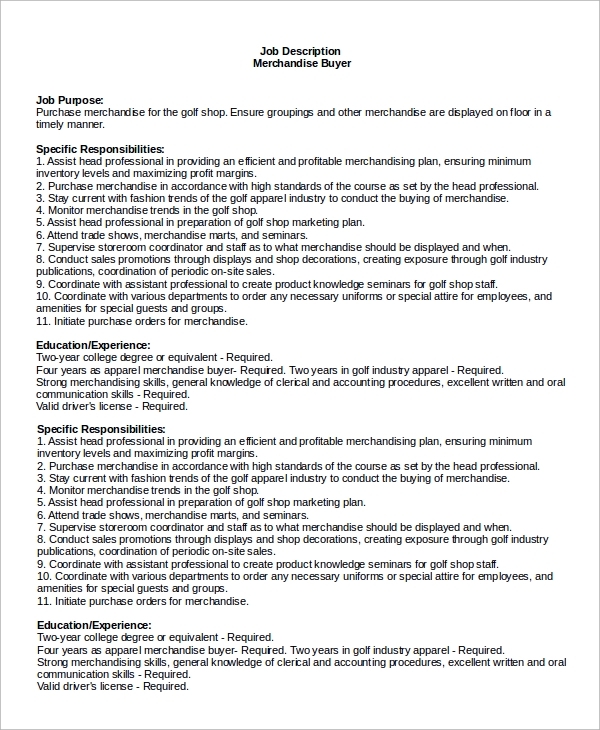 If you’re a retailer and you want your products to be sold, then these job description samples would be for you, since by using these samples you would be attracting applications from applicants with the desired qualifications, skill set and experience that would enable you to boost your sales by letting them strategically merchandise the products that you have up for sale, letting the customers find them visually appealing and convincing them to buy the products through genial conversation and actual marketing of the products concerned. 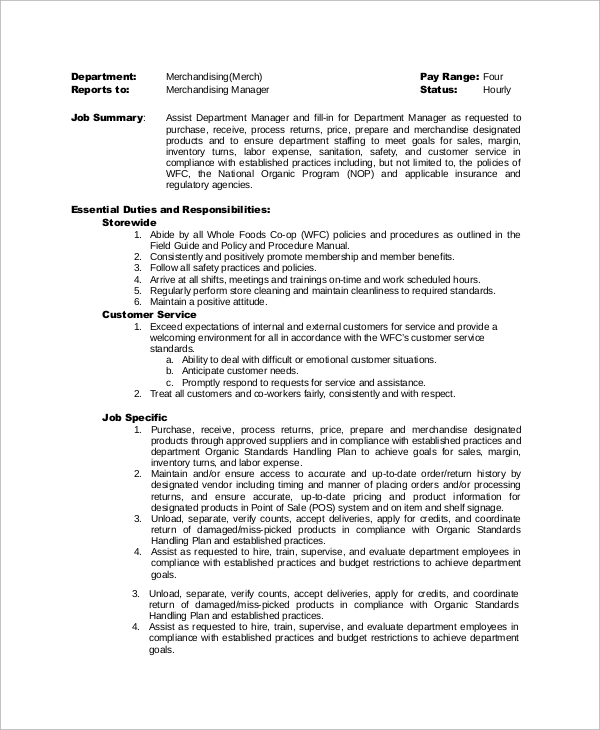 Thus, these job description samples will definitely help you to get the desired employees. 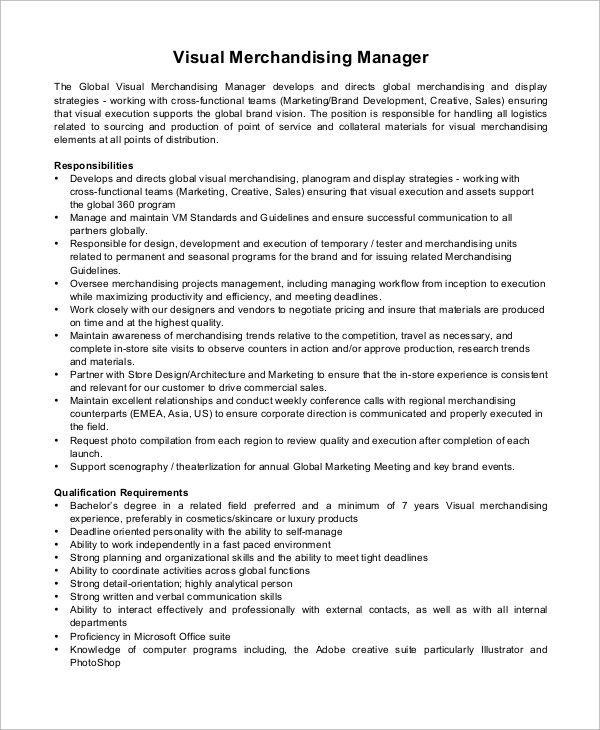 You can also see Quality Assurance Job Description Samples. 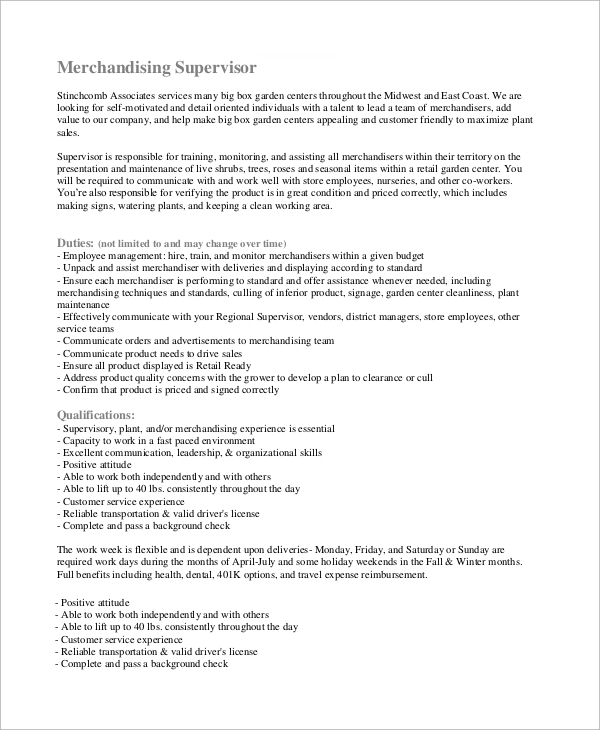 We have a large collection of Sample Job Descriptions from which you can choose the one which suits your purpose. Our samples are completely editable, allowing you to insert and edit any relevant information you wish to provide, allowing you to use the template as your own original job description.